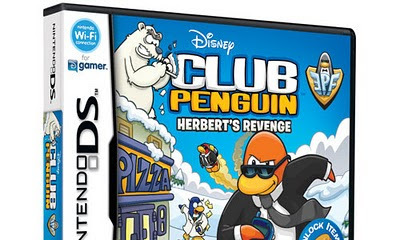 Disney's mega franchise Club Penguin returns with Herbert's Revenge, the sequel to 2008's Club Penguin: Elite Penguin Force for the Nintendo DS. There's no denying this series's popularity with kids -- the original game has sold over 1.5 million copies to date, a feat that only a handful of third-party Nintendo DS game titles can claim. Based on the popular children's MMORPG, Herbert's Revenge is a charming point-and-click adventure that allows fans of the franchise to take their Club Penguin experience on-the-go. 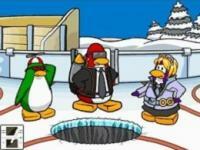 Players assume the role of a covert agent of the Elite Penguin Force to complete top secret missions on Club Penguin Island. Beginning where the previous game left off, the one-part sinister one-part bumbling polar bear Herbert has set off a popcorn bomb and blew up the penguin's HQ. Along with his sidekick Klutzy the Crab, the evil duo has plans to destroy the island oasis the Elite Penguin Force and numerous penguin inhabitants call home. Fans of the first game will instantly feel familiar with Herbert's Revenge as the island is nearly a perfect replica of what we've seen before, complete with shops, beaches, play areas and a hi-tech HQ. The gameplay mechanics are also identical and consist of roaming around the frozen island in search of clues, items and villagers to assist you on your mission to thwart Herbert's devious plans. To aid your journey, you're given an assortment of spy gadgets from Agent G consisting of a wrench (to tighten or loosen bolts), a spy phone (lets you talk to other agents), a spy log (containing your mission objectives and clues), a mechano-duster (to uncover clues), scissors (to cut rope or string), a comb (helps untangle messy fur), a decoder (to translate secret messages), and an HQ teleporter to instantly warp you back to the Elite Penguin Force home base. Each gadget is used at some point during the game to help you complete your missions. As an additional aid, every mission you're given some puffles, which are small, furry creatures native to Club Penguin and possess special skills such as smashing crates, flying using a propeller hat, melting ice, and welding. Disney made a few upgrades to the sequel including smoothing out the graphics and making the game overall a little more vibrant. Items can now be combined together to form more sophisticated items, such as tying a rope to a hook to crate a makeshift grappling hook. There's also a new help menu that gives players an overview of your mission objectives and indicates which steps need to be taken in order to complete the mission at hand. There are a few minor drawbacks to the game, including the occasional vague objective the will leave you scratching your head for a few minutes, and since it's a linear story you may resort to aimlessly wandering about Club Penguin in hopes of stumbling upon the next clue. Even more maddening is when you finally reach your destination and realize you don't have all the required items to proceed and the game won't let you backtrack to retrieve, leaving you no option but to reset the mission. Thankfully that only happened to me once during the game as I was attempting to scale a mountain but didn't have the tools required to do so. Like Pokémon games, Herbert's Revenge suffers from one of the most puzzling of shortfalls: one save slot. If you have multiple kids at home then be prepared to erase data each time someone new plays. With the default save slots for most DS games being two or three, I'm surprised games still release with a single save slot. To round out the game there are four enjoyable minigames found throughout the story mode and accessible from the main menu, including: Jackhammer, a mining game where you must strategically dig to the finish flag; Amazing Maze, a labyrinth navigation game that has you flipping switches and using puffles to open the correct path; Aqua Rescue, a life preserver tossing game where the objective is to keep an island afloat from underneath; and Grapple Gadget, a high flying platforming game where you swing via a grappling hook to victory. As a whole, Club Penguin: Elite Penguin Force: Herbert's Revenge delivers. The game has plenty of charm, witty moments and fun gameplay moments to keep kids hooked for some time. The controls are simple and easy to get into, and the graphics are undeniably eye-catching. 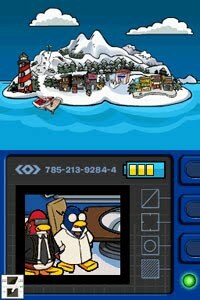 If you're a Club Penguin member you can even transfer your coins collected in Herbert's Revenge and upload them into your online account, how's that for nifty integration?